The Planting Process: What Really Matters? Uniform spacing requires perfect singulation and perfect seed placement. Misplaced, missing, and extra seed has relatively little impact on yield. Little yield improvement below plant spacing variability below 4 inches standard deviation. Uniform emergence requires site-specific considerations involving water and temperature. (Get list of other factors). The optimum planting window requires a favorable 5-day forecast, a soil that is "fit" to plant, and soil temperatures at least 50 F for the germination process to be initiated. ROW SPACING: Optimum row spacing decreases as plant population increases (in much of the Corn Belt). "Can't grow an ear in air!" Optimum range is between 28,000 and 32,000 plants per acre. Moisture influences response to row spacing. In Northern areas of the Corn Belt response to row spacing has not been consistent. Response has not been very large in Wisconsin. Consequently, most corn growers in Wisconsin plant corn in 30-inch rows. Intensive managers in Wisconsin are growing corn in <30-inch rows. Variable costs (fertilizer, fueld, etc.) ? Tillage using residue clearing ? Requires more time at planting ? Cultivation difficult or impossible ? Delayed planting during late May, corn yields decrease 1.5 to 2.3% per day delay. Planting corn after May 20 returns $45 to $85 less per acre and costs $0.20 to $0.50 more per bushel to dry than planting May 1 to May 5. Figure 1. 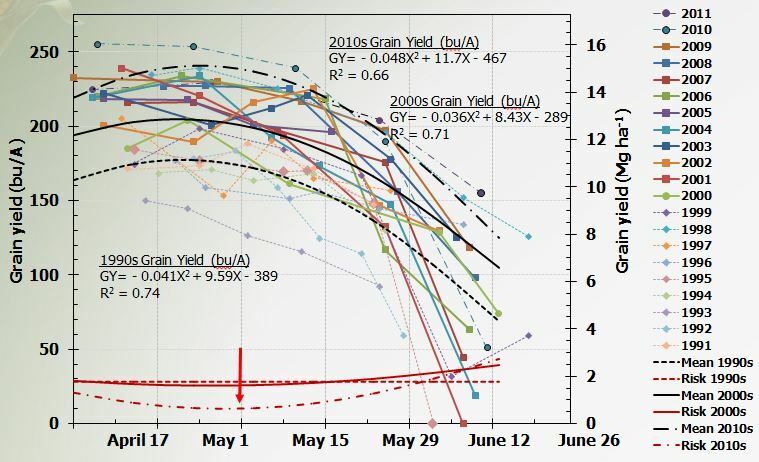 Grain yield response of full-season corn planted on various dates at Arlington, WI. The optimum date to plant corn is May 1. Risk is defined as the standard deviation (i.e. spread) of the points along the mean. Symptoms: Young corn plants (V3 to V8) are often leaning or appear ready to lodge. Before rootless corn is evident, corn plants may appear vigorous and healthy, but after strong winds, plants will fall over because there is no support. Leaning and lodged plants may also be wilted. These plants lack all or most nodal roots and appear stubby and blunt. Under favorable growing conditions, 4 to 5 sets of nodal roots develop above the seed and comprise the permanent root system of corn. The nodal roots are important in providing water and mineral nutrients that the corn plant needs for normal growth. Rootless corn problems are usually caused by weather related conditions that coincide with development of the nodal root system such as hot, dry surface soils, shallow planting depth, compact soils, loose, or cloddy soil conditions. Nodal roots will not grow into hot, dry compact soils. Also, the abrasive action of strong winds can break off secondary roots and inhibit establishment of the nodal root system. Excessive rainfall and shallow plantings may cause erosion and soil removal around the crown region that can result in rootless corn. Herbicide injury (e.g. 2,4-D, banvel) and insect feeding (e.g. corn rootworm) may be a contributing factor to rootless corn, but generally there is little direct evidence of their direct involvement. Poor root development may also occur in no-till fields that were planted when soils were too wet. In addition to likely compaction-induced root problems, abnormal root development may also occur because the furrow walls may have been smeared during the planting operation, preventing good seed-soil contact. If conditions turn dry, the walls of the furrow become hard and act as a barrier to root development. Roots growing in such an environment often appear flattened and under extreme conditions may result in plants' breaking and falling over during high winds. Management: Lodged rootless corn typically recovers with adequate rainfall that promotes crown root development. Cultivation to throw soil around exposed roots will aid the corn's recovery. Although the operator's manual serves as a guide for setting the planter, make your final adjustments in the field to account for varying soil conditions. Two major adjustments are planting depth and seeding rate. Planting depth, influenced by leveling adjustments, generally is controlled by either gauge wheels or press wheels. Adjustments of these are outlined in the owner's manual. Plant deep enough to ensure that adequate moisture exists for germination and early growth, but not so deep that emergence is poor or delayed. Because considerable soil can be moved by the planting unit, the depth should be determined by measuring from the seed to the impression left by the press wheel rather than to the original ground level. To achieve a good stand, this depth should be from 1 1/2 to 2 1/2 inches for corn and from 1 to 1 1/2 inches for soybeans or grain sorghum. Seeding rate in the field can be checked by uncovering and counting seeds in a row length equivalent to 1/1,000 of an acre (Table I). Multiply the seeds counted by 1,000 to obtain the number of seeds planted per acre. Following operator manual recommendations, adjust the seed metering mechanism as necessary to obtain the desired population. Also, dig up some seeds in each row to verify seed is being planted at the correct depth and spacing. Table 1. Length of row to equal 1/1,000 acre for various row spacings.